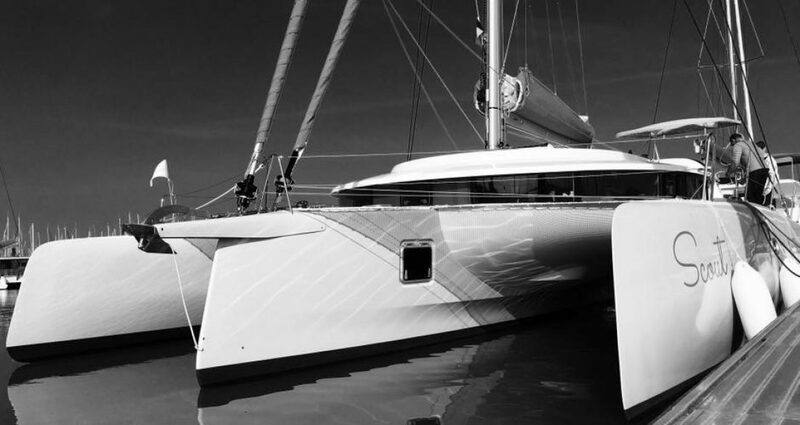 The Dream…… to buy a cruising multi-hull yacht in France and over the next few years sail it back to Australia via the Med and the Caribbean, the Panama Canal and the Pacific. A dream that started for me two years ago when Mike intrigued me by stating that he has always wanted to own a yacht. My interest was piqued immediately. I have always loved the idea of sailing and being near the water, but neither of us had had much experience. Me- sailing camp in high school and Mike, quite a bit of time on a wind surfer but none of it what you could call real experience. Our lives are pretty hectic. Mike is full-time employed in his profession. I run and manage our family business. We also have a full-time farm in the Northern Rivers NSW and 6 children. We both knew that if we were to own a yacht and have it sitting at our local marina, then chances are it would never get sailed and would just cost us money. No real joy in that. The only way that we wanted to own a yacht was to make sure that we would have the time to enjoy it. Then, if we had the time would we be happy just cruising the Gold Coast? Again no real long term joy there for us either. The dream then, was how could we take off from the commitments and structure of our life and make an adventure out of sailing a yacht. We decided fairly quickly that our ‘dream’ would be to buy a new yacht and to fulfil the adventure side of it, buy it in France and sail it back to Australia. We then quickly entered the logistic phase of how could we possibly make this happen. Two years ago we still had our two youngest finishing high school. Mike and I were entering our fifties, so although there was no great rush we soon quickly become obsessed with this dream and how and when were going to make it happen. Do we wait until retirement? Do we sell our business and farm and Mike take leave from his employer? Could we afford to make this happen? How do we leave the kids and parents? The real allure for us was to do this while we were still young enough. Our kids ( now ranging from ages 23 to 17) are hopefully not contemplating children and our parents ( 6 in total) are still fit and well. There would be no better time than the next few years but could we afford it and the time off the work. This is our blog of how we make it happen, our adventure ahead and how we got to where we are. It has not been a whimsical notion. The last 2 years have been spent studying books, reading blogs, searching the net and a bit of sailing all in readiness for us to depart from France in 2 years time. We know we have a lot more work to do but are inspired by the people before us who have done similar. It has become an obsession that we have talked of and have made plans for almost every day for the last 2 years. Today marks the day that all our deliberations have paid off and we move forward from here with a firm plan in mind and a schedule to make it happen. The big decisions have been made and now we just put it all into action. Categories: cruising, sailing | Permalink.